This new feature to Google Drive finally gives you a say in what content gets synced to your PC. Personally, I’m a big OneDrive user but I know a lot of people use Google Drive as their main cloud storage provider. If you live in Google’s world with Gmail, Google Docs, and Photos, then Google Drive is a sensible choice. 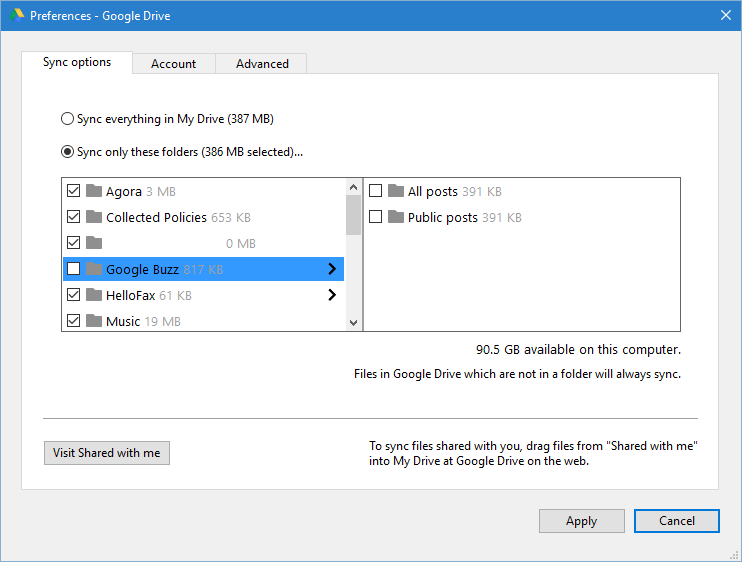 Recently, Google made Drive just a little bit better by finally adding selective sync to the desktop client. What this means is that you can choose to have some of your folders synced to your PC while leaving others completely in the cloud. To get started, click on the Google Drive icon in your system tray (that upward facing arrow on the far right of the taskbar). When the Drive pop-up panel appears click the menu icon (three vertical dots) in the upper-right corner and select Preferences. A new window appears opened to the Sync options tab. What you want to do now is click the radio button labeled Sync only these folders. Google Drive’s selective sync interface. Now a two-panel window appears listing all the folders in the root of your Google Drive cloud storage. If you want to deselect an entire folder just uncheck the box next to it. Another option is to stop syncing specific subfolders inside a parent folder. For example, if you have a Documents folder with subfolders for each month, you could choose to only keep the latest month and stop syncing the others. So Documents > April would still be on your PC but folders like Documents > January, Documents > February, etc. wouldn’t. To stop syncing subfolders, click on the parent folder in the left-hand pane. The subfolders will show up on the right. Now deselect the subfolders that you don’t want. 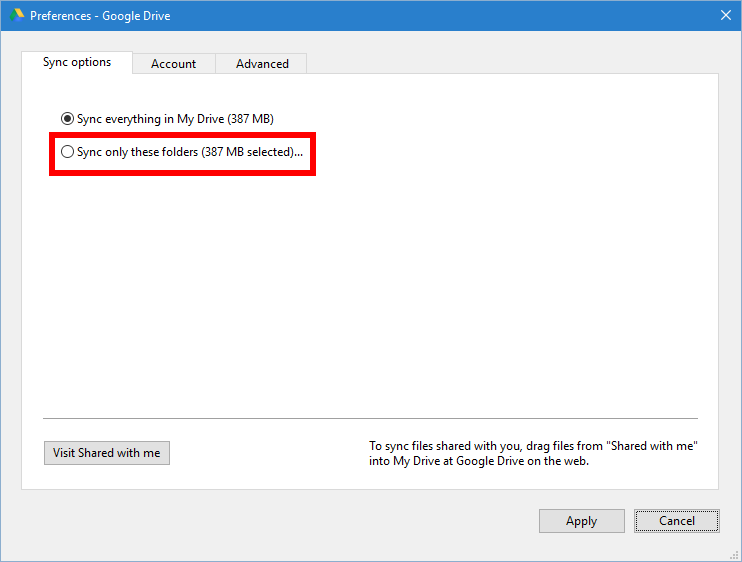 Once you’ve got Drive set up the way you like, click Apply, and a pop-up warning will ask you to confirm your selective sync choices. Once you confirm by clicking Continue Google Drive will automatically delete the nonsyncing folders from your PC. That will free up space on your local hard drive, while still leaving your folders in Google’s cloud. Those are the basics of Google Drive’s selective sync. A couple additional things to keep in mind: Selective sync only works for folders. You cannot selectively sync individual files. Also, if you delete files from your PC that are shared with others, Google warns that they may lose access to those files.